Rendering of Apple’s proposed Federation Square store. Apple in a statement to the The Sydney Morning Herald confirmed it will no longer pursue the Melbourne project, which called for the demolition of Federation Square’s Yarra Building. “We remain committed to serving our customers in Melbourne and across Australia,” an Apple spokesperson said. Heritage Victoria, a government body in charge of administering cultural heritage regulations in the state, handed down a refusal to Federation Square management’s application for demolition on Friday, the report said. 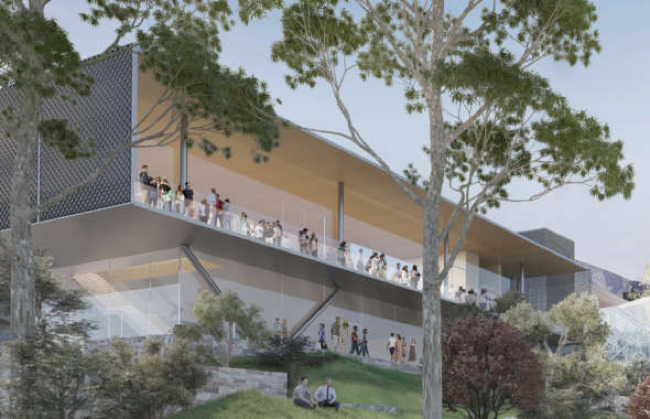 In its ruling, the authority found Apple’s proposed structure would be “visually dominant,” adding that the removal of the Yarra Building would diminish the space. Since announcing its intent to build a flagship store in Federation Square in late 2017, Apple has experienced major pushback from government officials, advocacy groups and the public at large. The location, with its museums, art galleries and eateries, is widely recognized as one of the most important cultural hubs in Melbourne. Apple’s outlet would be the first retail space in the complex. Apple attempted to address public concerns by revising the store’s design to better complement surrounding structures, but opposition to the project persisted unabated. In a move designed to halt Apple’s plans, the National Trust last August nominated Federation Square to the Victorian Heritage Register. Heritage Victoria subsequently issued an Interim Protection Order under the Victoria State Government’s Heritage Act of 2017, prohibiting development of the site for at least four months. Federation Square attempted to force the issue by applying for a permit to demolish the Yarra Building in December, a proposal quashed by today’s ruling. The development marks the third major setback for Apple’s retail team in the last two months. In February, Apple saw its bid to build a store in Stockholm’s Kungstradgarden blocked by public and government resistance, while mall owners in Israel earlier this month rejected financial terms for an outlet to be built in Tel Aviv.